It’s time to start mowing, watering, and feeding! Spring is here! The trees are budding and we are starting to see tiny blades of new growth popping up in the lawns. What a beautiful site! Now, what should you be doing to ensure that your lawn gets the best possible start this spring? Starting your weekly mowing regimen ASAP will help control any unwanted weeds you are seeing in your landscape. Mowing will help grassy weeds to die off faster and keep broadleaf weeds from seeding out. Mowing this time of year is key! Mowing causes stress on the grassy weeds due to the energy it takes for them to regrow. The more often you mow the more stressed they will become causing them to go to seed earlier, thus ending their life cycle. As the weeds become weakened, this allows more water and nutrient uptake for your newly awakened grass! Also, keeping the weeds at bay will prevent them from going to seed and repopulating. Remember – Mowing at the right height matters. The goal right now is to mow off the blooms of the weeds, but not mow off more than ⅓ of your existing grass blade in a single session. Mowing too short could shock your lawn and also reduce moisture retention. Also, lawns mowed too short will become stressed and be more attractive to pests and diseases. Start paying attention to your watering! This time of year is great because we are usually in no shortage for rain. As the temperatures stay mild, run your system every 6 days if we don’t get a good rain in between. Be mindful of the times you are running your system and for how long. If you are over watering you will be susceptible to fungal issues like Brown Patch. Although Brown Patch does not kill the grass, it is no sight for sore eyes. 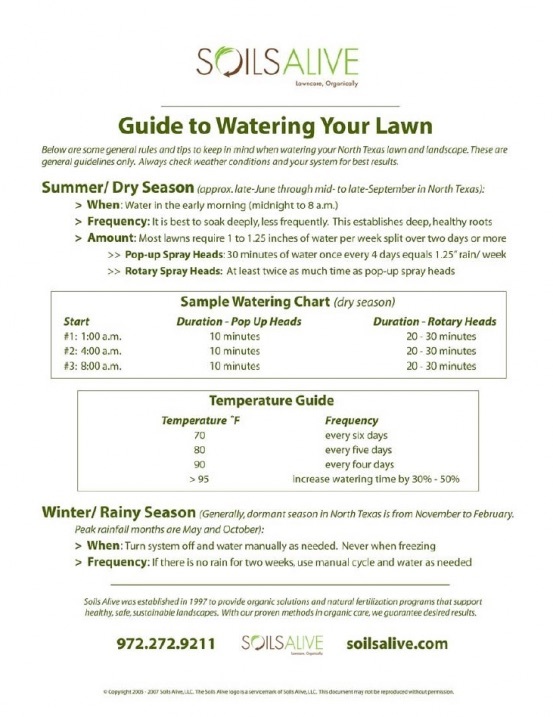 Follow our watering guide below for the best results! Give your lawn some food! If you are on our Soil Building Program then we’ve got this one covered for you! A good nitrogen source helps promote leaf growth for all plants so this is crucial for this time of year. Know that as your plants emerge from dormancy and finish flowering, they are going to need a boost of fertilizer to replenish spent resources. It takes a lot of energy to push out all of that new growth and flowers; by feeding in the spring, you’ll help your lawn and landscape plants look their best for the rest of the year.